This said by 200/400m great Michael Johnson. Thanks Simon. Don't know quite how I feel about this. If it speaks to detaching from outcome, then I'm in total agreement. The whole issue regarding the weighting of races in terms of importance throughout the course of a season remains a crucial aspect of racing. I also recommend grading races of course, A, B & C, etc. 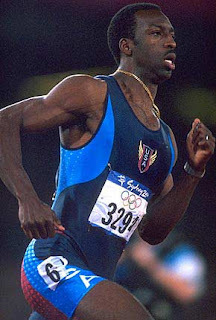 However the very process of designating a race as the key race of a season very often derails the chances of success of many athletes as they carry the weight of expectation into this race. Placing more importance on a race should hopefully increase the intensity & effectiveness of training leading into the event. This process should also increase commitment & willingness to give that little extra – but it is a very fine line that the majority of athletes overstep & end up with a performance less than expected or wished for as they over-emphasize the importance of the event. Self-honesty in terms of what your fitness really means is important. It is important to realize that your internal dialogue during key workouts that point to the possibility of such a peak performance being possible is different on race day. This difference is what determines success or failure. Consciously create & practice the mental skills that lead to access of this ability/conditioning – it will not just happen for most athletes. Accepting & realizing that racing is VERY different to training & having a set of practices that ensure you race to training status (or hopefully a little beyond) is an essential skill. Finally, many athletes do not have sufficient ability/experience/objectivity/presence of mind to interpret what the quality of their workouts really mean in terms of performance & often over-estimate their capabilities in terms of these workouts – a mistake that top pros do not make. It is often not possible for the average athlete to train at or beyond race intensity to meet the requirements of race day – being fully prepared for the rigors of racing to the max. Despite a lifetime of coaching & many personal competitive endeavors, I still often royally screwed up my pace/effort, focus or some other mental skill on those occasions when I did get out there!